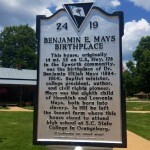 Dr. Benjamin Elijah Mays (1894-1984) born in 1894 just on the outskirts of Ninety Six, in the Epworth community. Dr Mays was a Baptist preacher, an author and the President of Morehouse College in Altanta, Ga where he mentored to young black activists such as Martin Luther King Jr. A peaceful and religious man, Dr. Mays taught the mind was the greatest gift from God and to be used wisely. Dr Mays was the orator at Martin Luther King Jr’s funeral. Dr. Mays was also an adviser to four United States Presidents-Kennedy, Johnson, Nixon and Ford, as well as honored by President Jimmy Carter. 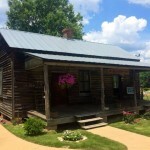 Recently, his home place, believed to be his birthplace, was moved to The City of Greenwood and is now a museum www.mayshousemuseum.org . The old house was originally located on SC Hwy. 178 ( Benjamin Mays Highway) just below the intersection of SC Hwy. 248. At the point of where his house once stood, there is a roadside marker which reads: “Dr.Benjamin E. Mays the spiritual mentor of Martin Luther King, Jr. Born here in 1894. 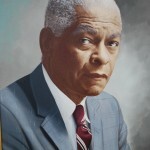 Served as president of Morehouse College 1940-67 and as presidential adviser. The stone marker was put in place during a ceremony attended by Dr. Mays’ niece and Coretta Scott King, as well as Dr. King’s children. Today a portion of SC Hwy 178 has been renamed to Benjamin E Mays Highway in tribute to the contributions Dr. Mays has made to society.